Volkswagen is likely to add a mid-sized crossover that would be built at its U.S. factory. A small four-door wagon concept called the Bulli that has Microbus-like styling cues may also be on the way. But VW has nixed plans to start U.S. sales of vehicles from the Up minicar family that was unveiled last month at the Frankfurt auto show. And there are no plans to sell a Polo-sized subcompact in the United States. Polo: VW has said repeatedly that it wants to bring the car, which is the size of a Ford Fiesta, to the United States, but no time frame has been announced. Beetle: The redesigned Beetle is 6 inches longer, 3.3 inches wider and 0.5 inches lower than its predecessor. The new sporty look is aimed at attracting more male buyers in North America and helping it sell better in Europe. A 2.0-liter four-cylinder turbodiesel version will be added next year. The high-performance Beetle R model and a convertible version go on sale in 2012. Golf: The 250-hp R model arrives early next year. It will be powered by a turbocharged 2.0-liter, four-cylinder engine, and VW says it will be the most powerful Golf ever sold in the United States. 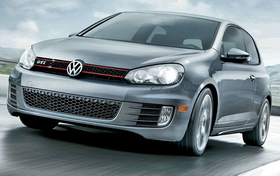 A redesigned Golf arrives here in 2014, followed by a plug-in hybrid version in 2015. Jetta: The range-topping GLI version of VW's compact sedan debuted this autumn. The GLI stickers for nearly $25,000 -- $8,000 more than the redesigned base Jetta introduced last year. The GLI has a 200-hp 2.0-liter turbocharged four-cylinder engine teamed with a six-speed manual transmission. A dual-clutch automatic with paddle shifters on the steering wheel is optional. A hybrid version of the Jetta sedan goes on sale in 2012. The SportWagen station wagon, which is based on the previous-generation Jetta, gets a freshening in 2012. BlueSport: The mid-engine two-seat roadster, shown as a concept at the 2009 Detroit auto show, would share a platform with Audi and Porsche. The BlueSport could be produced starting in 2014; no decision has been made on U.S. sales. Passat: Sales of the four-door sedan began this autumn. The U.S.-built version is sold only in the United States and Canada. VW is not expected to offer a station wagon version, as it has in the past. No significant changes are expected in the next few years. CC: The coupe-styled four-door sedan, based on the previous-generation Passat, will get a freshening in 2012 with new headlights, bumpers and possible sheet-metal changes in the rear. A redesign is expected around 2015. Phaeton: A second generation of the premium sedan went on sale in Europe last year. There is talk that it could return to the United States, but no dates have been given. The Phaeton was pulled from the United States in 2006 because of slow sales, attributed in part to a $65,000 price tag that topped $100,000 with the 12-cylinder engine. Eos: The hardtop convertible got a freshening this year with a new grille and bumpers and an improved interior. The car is scheduled for a redesign in 2014. Tiguan: The compact crossover was freshened this autumn with a new front grille, headlights and taillights. A redesign is expected in 2015 with a new range of engines, including a diesel, and a plug-in hybrid version. Touareg: The SUV will be freshened in 2013. Mid-sized crossover: VW is considering a new crossover that would be built in Tennessee. It would fit between the slow-selling Touareg and compact Tiguan. Routan: No decision has been made on whether to offer a second generation of the minivan. The Routan is based on the Chrysler Town & Country minivan, which is built by Chrysler Group. The next-generation Chrysler minivan is due in 2014. VW insiders have suggested that a seven-passenger crossover might replace the Routan. Bulli: The Microbus-inspired four-door wagon concept debuted at this year's Geneva auto show. It could go into production in 2015 and would come to the United States. At 156 inches long, it is considerably smaller than VW's Microbus. The Bulli is shorter but wider than the retro Microbus concept shown in 2001 at the Detroit auto show. The production model might be stretched to accommodate three rows of seats. The concept has two rows, seating six.